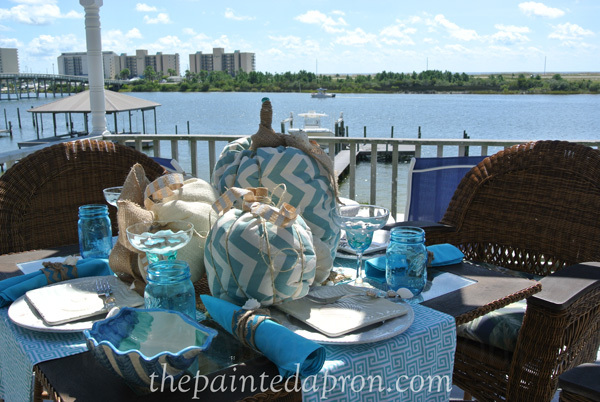 We’re dining alfresco today and joining Chloe for the Celebrate and Decorate blog hop! Please come right in, I’m so glad you’re here! We’re just getting set for an outdoor fête! Please visit my friends below and see what they have done! Jenna, I knew I would love your Tablescape and you didn’t disappoint! Dining near the pool is a good idea! Aqua and red is a great color combo and I love your use of pattern. The flowers are perfect along with the strawberry pitcher and your picnic basket. I would love to sit at your table and enjoy all of your wonderful food! You captured the essence of beach life! Jenna, how clever you are! I see your picnic basket project now in its glory, and your table is cheery and inviting. Your surroundings are amazing, whether it’s on the balcony or down at the picnic table. Jenna, You are too much fun! I love your rhyming! God just filled you with talent! Painting, cooking, designing, and full of energy are words that come to mind. All of your vistas at your beach house are such happy places. I hate I didn’t get to come when the southern bloggers visited. Your alfresco blog hop post is delightful today. So many cute details. I didn’t miss the checked jar top as a coaster. Too cute. Love all the cheerful colors and patterns and pretty flowers. Great ambience for dining alfresco at the beach! You had me at seaside picnic Jenna! Very inviting and colorful. I also love reds and aqua together. Well done. I love your seaside picnic with all the colors of the sea. What a perfect place to enjoy being outside out of the sun with the pool nearby. I know the area where you live and it is so gorgeous! Lucky for you we have long summers here, more time for you to enjoy being at the beach. Our fall beach trip is planned and I can’t wait!!!! Awesome! I love the mix and match of colors and patterns for your picnic. I felt like I was in the countryside and at the same time at the beach. What a great way to combine the two. It is so interesting putting together aqua and red. I am a red and white check girl and would love to see it in all tablescapes. There is something so down right “at home” about your picnic. The strawberry pitcher is so charming. It adds even more whimsy. Your tablescape makes me want to put on my bathing suit, grab a beach towel and sangria and head to the beach. I love it all! The strawberry pitcher is darling, the colorful drinking straws, the napkin rings. As usual, you’ve thought of everything! And in this heat, you were brilliant to set up your picnic beside the pool! Do you have floating trays so we could eat in the pool? hahaha. Ha, that would be interesting! You always put a smile on my face too Rosie! Very sweet tablescape Jenna. The picnic basket is darling. Even your straws match and brighten the table. Cute napkin rings and the party favors are special. Loving that strawberry pitches as well. So much fun blog hopping with you. Thank you Linda, it’s been a fun week! I don’t think I have seen the Backyard Bar area before, but that would definitely be my favorite spot because it is protected from the sun. Your table is really cute with all the bright color, and I love the color scheme you have chosen. Very inviting! I so enjoyed your rhyme that matched your pics! And your talent extends to the table as well – love the colour and pattern combinations with the stripes, dots and checks! While I always enjoy seeing your tables set on the deck it was really fun to see one “down under” by your pool – looks so inviting! Your flowers in the mason jars as a centerpiece are terrific – repetition down the length of a table is so appealing to me. Fantastic napkin rings and your picnic basket is wonderful. This blog hop has been so fun with all the different outdoor settings and my “hop” here has been so inspiring! 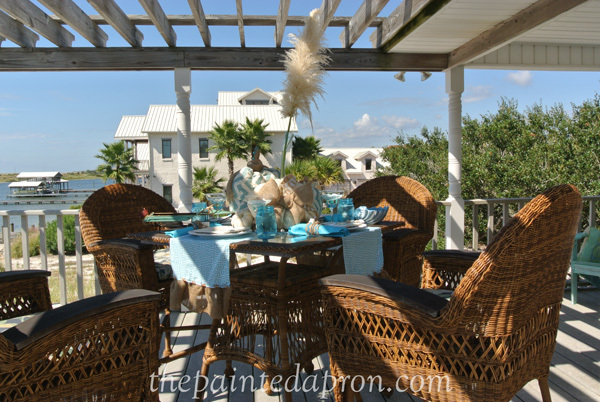 Love the beachy feel, looks like where my daughter lives,Nothing like dining near the water for an an amazing breeze! I love the the jars. Will you adopt me? I am swooning over your seaside setting, The dishes, linens, flowers, and your beautiful touches have created an unforgettable tablescape. The bottlecap fish is adorable and inventive, and I love your napkin rings. You have captured the essence of the Gulf Coast. You must enjoy your place at the shore as much as I enjoy being in Maine! I always enjoy seeing your tables as they reflect the feel of the beach and sea. You can’t beat that. thanks Lynn, it’s going too fast 😦 I loved watching the convention in Philly, and learning details about it I never knew before, it sounds like a fabulous place to live! I love that basket. Heck, I love that you have a place to dine in the shade practically right on the sand! You must have the best time there. We were thinking the same with the seashells, weren’t we! Your mixed patterns are so fun…your whole tablescape says summer fun to me! Thank you so much for being a part of the blog hop! Awww I love all your outdoor tablescape said, Jenna, and especially the one down below. It’s so cheery, and fun with th bright colors, polka dots and crafty additions that you’ve created. Of course, I always appreciate your cute rhymes with each and every photo!!! My dream is to fix this area up to a more decorated space and outdoor kitchen, but in this climate and potential for storms and hurricanes, we have to keep things pretty weatherproof and secured-but it is a great spot for a bite! I really love your tablescape. The colors are just perfect. What a gorgeous setting! How lucky you are to have the water and sand, pool and breeze right outside your door! You’ve created a lovely Tablescape. 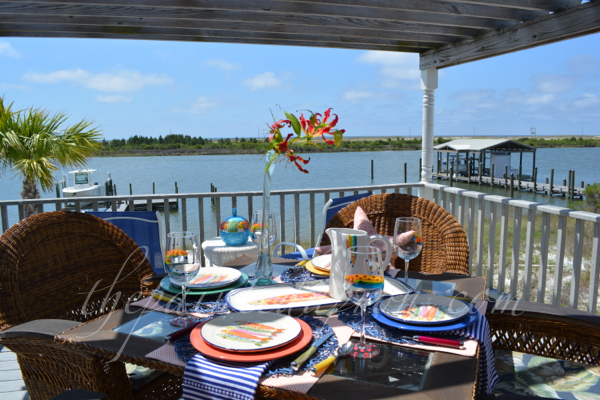 Being by the water always makes me hungry and your table is a great place for dining. The setting is really great!! It’s beautiful! Blue and aqua is my favorite color combo! 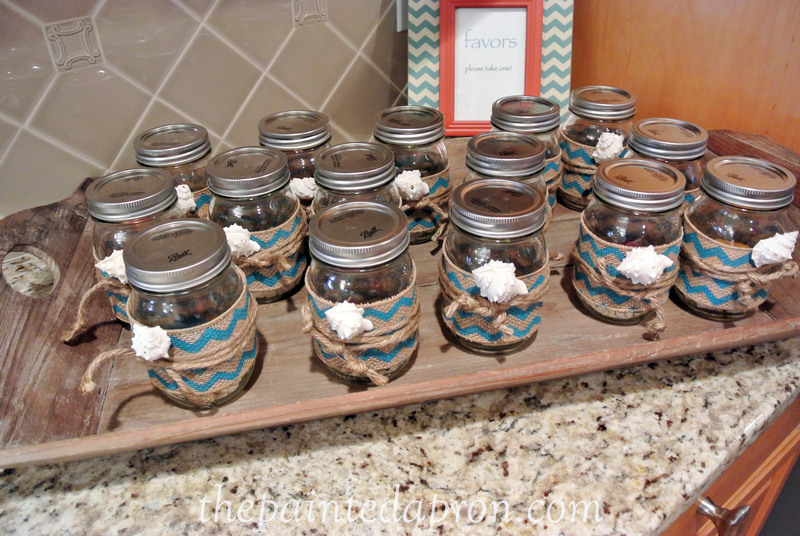 Those mason jars are a win!! Love it! Love your poetry! And especially for beach home. When I saw your Florabama sign, I had to read your about and find out where you live. 🙂 I am in Hueytown, just outside of Birmingham. I am happy to find your blog and hope to become bloggy friends.